The configuration of the supply chain network (SCN) is one of the strategic issues that have a major impact on the overall performance of the supply chain. A well designed SCN leads to an ability to reduce the supply chain total cost. These purposes are influenced by the supply chain strategy, which is based either on direct or indirect supply or shipment. In the case of direct shipment, the products are directly transported from the point of origin to the customers. In the classic transportation problems, it is usually assumed that the transportation time and costs are certain. Most existing mathematical models neglect the presence of uncertainty within a programming environment. This uncertainty might come about because of traffic jam, machine malfunctioning, defect in raw material, interpretation of various events and etc. These emprise parameters can be considering as fuzzy numbers. In this study, for the first time a mathematical model for a responsive, multi-product two-stage, SCN with possibility of direct shipment is proposed. Because of the unpredictable factors that mentioned above, cost coefficients are considered as trapezoidal fuzzy numbers. Therefore, for validation, the proposed model is coded by GAMS software. The results showed that relevant model is valid. Basirzadeh, H. & Abbasi, R. (2008). A new approach for ranking fuzzy numbers based on cuts. Journal of Applied Mathematics and Informatics, 11, 767–78. Chanas, S. & Kuchta, D. (1996). A concept of the optimal solution of the transportation problem with fuzzy cost coefficients. Fuzzy Sets and Systems, 82, 299–305. Ebrahimnejad, A. (2016). A New Method for Solving Fuzzy Transportation Problem with LR Flat Fuzzy Numbers. Information Sciences, 357, 108-124. 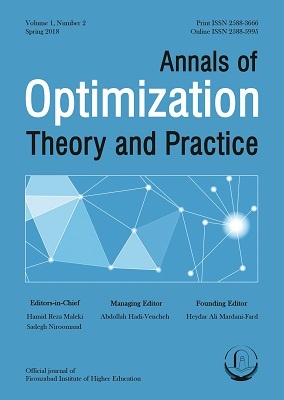 Farahani, R.Z., Rezapour, S., Drezner, T. & Fallah, S. (2014). Competitive supply chain network design: An overview of classifications, models, solution techniques and applications. Omega, 45, 92-118. Gao, S.P. & Liu, S.Y. (2004). Two-phase fuzzy algorithms for multi-objective transportation problem. The Journal of Fuzzy Mathematics, 12, 147-155. Giri, P.K., Maiti, M.K. & Maiti, M. (2015). Fully fuzzy fixed charge multi-item solid transportation problem. Applied Soft Computing, 27, 77-91. Hirsch, W.M. & Dantzig, G.B. (1968). The fixed charge problem. Naval Research Logistics, 15, 413–424. Jimenez, F. & Verdegay, J.L. (1998). Uncertain solid transportation problems. Fuzzy Sets and Systems, 100, 45–57. Jimenez, F. & Verdegay, J.L. (1999). Solving fuzzy solid transportation problems by an evolutionary algorithm based parametric approach. European Journal of Operational Research, 117, 485–510. Kocken, H. G. & Sivri M. (2016). a simple parametric method to generate all optimal solutions of Fuzzy Solid Transportation Problem. Applied Mathematical Modelling, 40, 4612-4624. Li, Y., Ida, K. & Gen, M. (1997). Improved genetic algorithm for solving multiobjective solid transportation problem with fuzzy numbers. Computers & Industrial Engineering, 33, 589–592. Liu, P., Yang, L., Wang, L. & Shukai. L. (2014). A solid transportation problem with type-2 fuzzy variables. Applied Soft Computing, 24, 543–558. Lin, L. Gen, M. & Wang, X. (2009). Integrated multistage logistics network design by using hybrid evolutionary algorithm. Computers & Industrial Engineering, 56, 854–873. Molla-Alizadeh-Zavardehi, S., Sadi Nezhad, S., Tavakkoli-Moghaddam, R. & Yazdani, M. (2013). Solving a fuzzy fixed charge solid transportation problem by metaheuristics. Mathematical and Computer Modelling, 57, 1543–1558. Mahmoodirad, A. & Sanei, M. (2016). Solving a multi-stage multi-product solid supply chain network design problem by meta-heuristics. Scientia Iranica E, 23, 1429-1440. Omar, M.S. & Samir, A.A. (2003). A parametric study on transportation problem under fuzzy environment. Engineering Journal of the University of Qatar, 15, 165-176. Pishvaee, M.S., Rabbani, M. (2011). A graph theoretic-based heuristic algorithm for responsive supply chain network design with direct and indirect shipment. Advances in Engineering Software, 42, 57–63. Pramanik, S., Jana, D.K. & Maiti, M. (2013). Multi-objective solid transportation problem in imprecise environments. Journal of Transportation Security, 6, 131-150. Pramanik, S., Jana, D. K., Mondal ,S.K. & Maiti, M. (2015). A fixed-charge transportation problem in two-stage supply chain network in Gaussian type-2 fuzzy environments. Information Sciences, 325, 190-214. Rani D. & Gulati, T.R. (2014). A new approach to solve unbalanced transportation problems in imprecise environment. Journal of Transportation Security, 7, 277-287. Sakawa, M. & Yano, H. (1986). Interactive fuzzy decision making for multiobjective nonlinear programming using augmented minimax problems. Fuzzy Sets and Systems, 20, 31-43. Sakawa, M., Yano, H. & Yumine, T. (1987). An Interactive fuzzy satisfying method for multi-objective linear programming problems and its application. IEEE Transactions on Man, Systems, and Cybernetics, 17, 654–661. Samanta, B. & Roy, T.K. (2005). Multi-objective entropy transportation model with trapezoidal fuzzy number penalties, sources and destination. Journal of Transportation Engineering, 131, 419–428. Singh, S. & Gupta, G. (2014). A new approach for solving cost minimization balanced transportation problem under uncertainty. Journal of Transportation Security, 7, 339-345. Sanei, M. Mahmoodirad, A. & Niroomand, S. (2016). Two-Stage Supply Chain Network Design Problem with Interval Data. International Journal of e-Navigation and Maritime Economy, 5, 074 – 084. Yang, L. & Liu, L. (2007). Fuzzy fixed charge solid transportation problem and algorithm. Applied Soft Computing, 7, 879–889.